More than 78,219,802 beer lovers served! Hours: Sunday-Thursday 11:30am-midnight, Friday-Saturday 11:30am-1:00am. 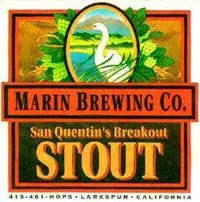 Located almost in the shadow of San Quentin. 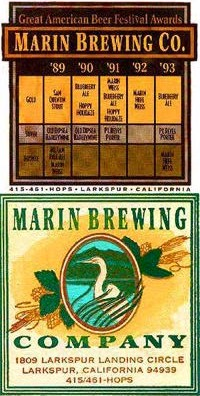 One of the best Bay Area breweries, known for their Pale Ale, Stout, and fruit beers. Everything they make is rocket fuel, but it usually tastes great. Good food, OK service, OK prices, reasonable crowd. Directions: 80 East/580 West from the Bay Bridge. Keep left and take 580 West over the Richmond/San Rafael Bridge. Take the second exit after the bridge (Sir Francis Drake). Turn right at Larkspur Landing Circle, across from the Ferry Terminal. Or, you can get there from Highway 101, but I forget how. I owe a big thank-you to Brendan Moylan for sending the bottles in July 2000! Dark amber, high carbonation, thick head. Chocolatey, caramelly, spicy hop aroma. Medium body, big hop flavor, mildly bitter caramel finish. Red-amber, OK head, very low carbonation. Overbearing Tettnang aroma and flavor. Too bad. 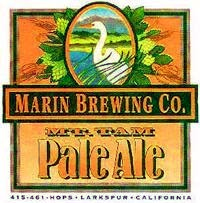 Darker than the Mt.Tam Pale Ale, good thick head. Malty nose, touch of hops. Real Smooth. Real alcoholic Creamy thick. I like this a lot, but I'm not sure I could drink a lot of it. It's a very big beer. Yellow hazy. OK head, good carbonation. Blueberry aroma is detectable from two feet away! Some malt, too. Flavors are blueberry and malty...same sort of maltiness as Boston Beer Company Samuel Adams Lager. Dark (sort of) yellow. Thin head, cloudy. Hop aroma, not much blueberries. Fizzy. Thin. Not much flavor...sweet. Mix it with Stout for a Black and Blue. Massive beer. Hugey malty. Big herbal, grassy, fruity hop flavor. Fairly bitter. Surprisingly clean finish. A "Double IPA" brewed for the pub's 11th anniversary. Orangey-red, moderate carbonation, thick head. Citrusy, spicy hop aroma. Big bitter beer. Lots of hop flavor, malty and chewy, nice bitter finish. Yellow opaque. OK - not great - head. Some wheat aroma, some spiciness, some alcohol. Excellent wheat beer. Heavy and just hoppy enough with a gallon of alcohol per pint. Yellow, nearly opaque, high carbonation, thick head. Citrusy hop aroma. Light body, big wheat flavor, mild citrus hop flavor, clean finish. Same color as Marin Weiss, only hazy. Can't smell hops at all. Tastes good. Not as bitter as Marin Weiss, so you can actually taste the wheat. good refreshing beer. Warms you on the way down. Served properly without lemon! Red. Thin head. Clear. Liquid smoke nose. Powerful. Smells like BBQ sauce...not authentic. Flavor not as assertive as the aroma. Medium body, clean. Long smoky finish. Very pale. Dry, clear spicy nutmeg flavor. This is an excellent beer that has a mysterious flaw that I can't identify. Amber, slight haze, moderate carbonation, good head. Fresh spicy Centennial hops aroma. Medium body, hugely bitter all the way through. Long long long bitter finish. Red, some haze. Good head. Caramel nose. Sharp...some oxidation. Malty thick sweet, lousy choice of hops. Overblown Tettnangs, like Redhook. Pretty nasty. 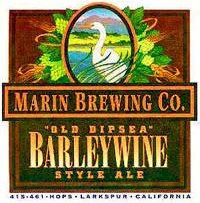 Worst Marin beer I've ever had, and to make things worse, I got to watch the Rangers drop a 6-5 game at Pittsburgh. Medium body, smooth. Big fruity citrusy hops on top of sweet caramel malt. Reasonably bitter, with a clean fruity finish. Amber, moderate carbonation, thick head. Spicy hop aroma on a malty background. Medium-light body, big hop flavor, mildly bitter. Dark yellow. Very thin head. Fresh hop aroma, but not very strong. Spicy. Very cold. Quite bitter...long finish is great! Real nice color, carbonation. Smells bitter, but not obnoxious. Pretty good beer. Smooth, well-balanced. Feels stronger than it is. Not necessarily for drinking and driving. Copper-amber. Very hoppy nose. Dry-hopped to the extreme. Very sweet, per style, but not at all offensive. Great barleywine. Utterly black, thick head. Hoppy coffee aroma. Medium body, creamy, real nice roasty flavor. Mild hoppy flavor in the sweet finish. Very dark brown, possibly opaque. (It's dark in here.) Huge brown head. Faint spicy hops...no black malt aroma. "Dr.Pepper" character from particular hops combination with black malt. Finishes quick, astringent. Fiercely black, thick brown head. Rich chocolate aroma. Thick, chocolatey, mildly bitter and roasty at the end. Black opaque. No head. Faint burnt aroma. Thick and smooth. Bitter from black malt. Very nice. Quite yellow...pilsner-colored. Peach aroma. That's all...just peach. Fizz hits the tongue just before the peach flavor fills the mouth. Finishes very sweet, lingers. Some astringency in finish. Amber. Some small chunks and flakes. Moderate head. Big body, silky-smooth. Loads of sweet malt and loads of Belgian fruitiness. Lots of alcohol, but not hot. Tasty, but not real complex. Yellow, no head. Good hops aroma - if you take out the lemon. Very bitter - too much for the wheat sweetness. American-style wheat ale. Amber. Lots o'bubbles. Sweet and malty aroma. Some spiciness. Good crystal malt flavor. Simultaneous bittering hops. Clean finish. Overhopped? Yellow-amber, clear. Earthy aroma. Rocket fuel! Good flavors.